GRP pipes are composites technology which have developed over the past 80 years. The technology has found its place in the aviation industry, manufacturing industry and civil industry just to mention a few. For example the latest planes such as Air Bus 380 and 350 have many components made from composite technology may be more that 80%. According to Dominic Sikuka the General Manager at Fiberpipe the sole manufacturer of Flowtite glass fibre reinforced (GRP) pipes and fittings in Sub-Saharan Africa, GRP pipes performance is quite exceptional, their technical characteristics are second to none. They are now used over the world and are not limited to applications like: Bulk water and treated water, Sewer, hydropower installations, desalination plants, irrigation, and Industrial corrosive applications. “GRP pipes are corrosion resistant, light weight, high strength, smooth bore; have superior hydraulic characteristics and an extended lifespan of over 150 years. They are also made from natural elements that that do not pollute the environment,” he said. Mr. Sikuka further added that, GRP pipes are very easy to install hence they do not require specialized technical skills like certified welders; it therefore provides employment for the local population especially females as it is light and does not require heavy lifting equipment. However, installation of any pipe is critical therefore there is need for technical assistance during installation. “Technically, there is need to consider if the installation is above or below ground as GRP pipes can be installed either below or above ground. Moreover, GRP is a very competitive product; when installed there is none or limited maintenance,” he affirmed. The supplier can, at the request of the purchaser and within the terms of the agreement between the purchaser and the supplier, provide a Field Technician. The Field Technician can advise the purchaser and/or the Installer to help him achieve a satisfactory pipe installation. It is recommended that “on the job” field service should be engaged in the initial stage of installation and may continue periodically throughout the project. The service may range from continuous (essentially full time) to intermittent depending on agreement between purchaser and supplier. 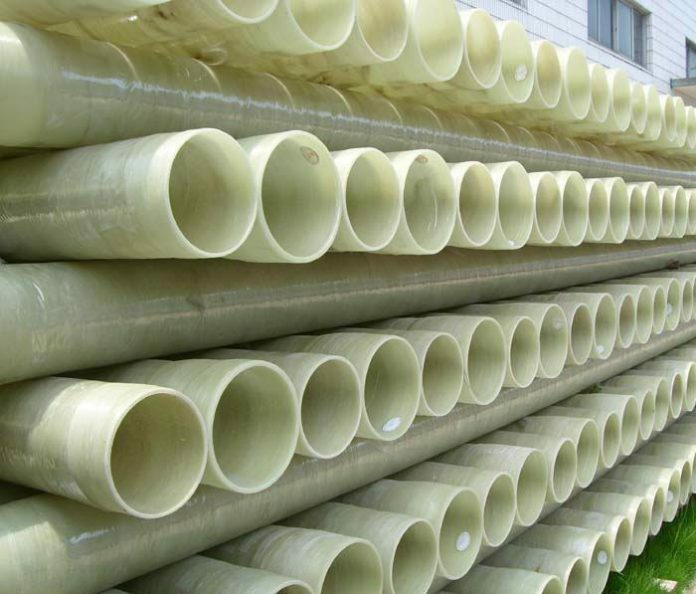 Glass-reinforced polyester (GRP) pipe, like virtually all pipe made with petrochemicals, can burn and is therefore not recommended for use in applications which are exposed to intense heat or flames. During installation, care must be taken to avoid exposure of the pipe to welder’s sparks, cutting-torch flames or other heat/flame/electrical sources which could ignite the pipe material. This precaution is particularly important when working with volatile chemicals in making layup joints, and repairing or modifying the pipe in the field. Composite technology is the space technology for the future. It must be embraced at all cost.